AFM is a powerful tool for quantifying single-cell mechanics. 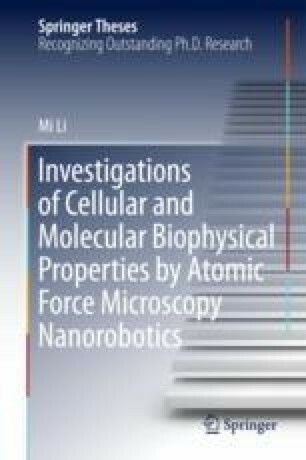 The principle and methods of measuring cellular Young’s modulus by AFM was firstly presented. Then spherical probes were fabricated by gluing individual spheres to the AFM probe based on optical-guided AFM micromanipulations. With the use of spherical probes, the Young's modulus of human erythrocytes and three types of human suspended cancerous cells with different invasiveness was measured, showing the close links between cell elasticity and cell invasiveness capabilities.